A year-old organization, dedicated to promoting Indian arts in the US, is hosting its most ambitious project yet -- a four day event in New York focusing on different aspects of the life of Mahatma Gandhi. Aptly titled, Perspectives of Gandhi, the program sponsored by the Indo-American Arts Council will run from October 1 to 5 at different venues in Manhattan. "For the first time in the US we have a festival of Gandhi, combining scholarship, art, theater, history and film," Aroon Shivdasani, executive director of the IAAC, said recently. She added that a review of Gandhi's life is important, especially in the light of the general election in India and the fact that "he fought through passive resistance for our Independence and to give us this democracy." The program begins with a screening of Shyam Benegal's 1995 film, The Making of the Mahatma. Based on the book, The Apprenticeship of the Mahatma by South African writer Fatima Meer, the movie depicts the transformation of Gandhi from a Westernized barrister to the voice of oppressed Indians in South Africa. It stars Rajat Kapur as Gandhi and Pallavi Joshi as his wife, Kasturba. The Making of the Mahatma will be screened on Friday, October 1, 1999 at 6.30 pm at the Asia Society, 725 Park Avenue at 70th Street. The screening will be followed by a panel discussion with Benegal, the consul general of South Africa and members of the Martin Luther King Society for Non-Violence. On Saturday, October 2, 1999 (which also is Gandhi's 130th birth anniversary), the IAAC will present Feroz Khan's internationally renowned play, Gandhi vs Gandhi. The play explores Gandhi and his family life, with a focus on his troubled relationship with his eldest son Harilal. Last year, Khan brought the play to the US with actor Naseeruddin Shah playing the Mahatma. This year's production has a new cast. The play will be performed at Hunter College's Kaye Playhouse on East 68th Street. Also at the Kaye Playhouse, on October 3, 1999, IAAC presents Pradeep Dalvi's controversial play Nathuram Godse: An Experience. In the last couple of years, Dalvi's play, an attempt to humanize Gandhi's assassin, has resulted in widespread political demonstrations in India, mostly conducted by the supporters of the Congress party. Protests in the Indian Parliament even forced the Shiv Sena-led Maharashtra state government to ban the play. Both plays will be staged at 7 pm. The programs include discussions with the playwrights. Finally, on Tuesday, October 5, 1999, in collaboration with Columbia University's Southern Asian Institute, IAAC will present a panel discussion on Gandhi. Participants will include playwrights Khan and Dalvi, film-maker Benegal, and academics Dennis Dalton and Partha Chatterjee. The program will be moderated by Akeel Bilgrami. The discussion will be held from 6 pm to 8 pm, at Columbia University's Alfred Lerner Hall. IAAC was established in the fall of 1998. 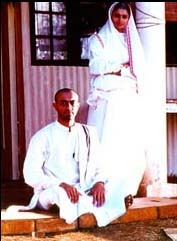 In October 1998, the organization hosted its first program -- the New York premiere of Deepa Mehta's film Earth. Other programs sponsored by the group have included a dance recital by Mallika Sarabhai; a screening of Vinay Shukla's Godmother, followed by a discussion with the film's star Shabana Azmi; and a program entitled Passport to Contemporary Art in which several New York-based Asian-Indian artists opened up their studios to IAAC supporters. For further information on Perspectives of Gandhi, contact the Asia Society at (212) 517-ASIA; the Kaye Playhouse at (212) 772-4448; or call the Indo-American Arts Council at (914) 576-6231.